We’re excited to say we just released an update for our popular GlassWire Data Usage app for Android. This new update includes dark themes many of you requested. 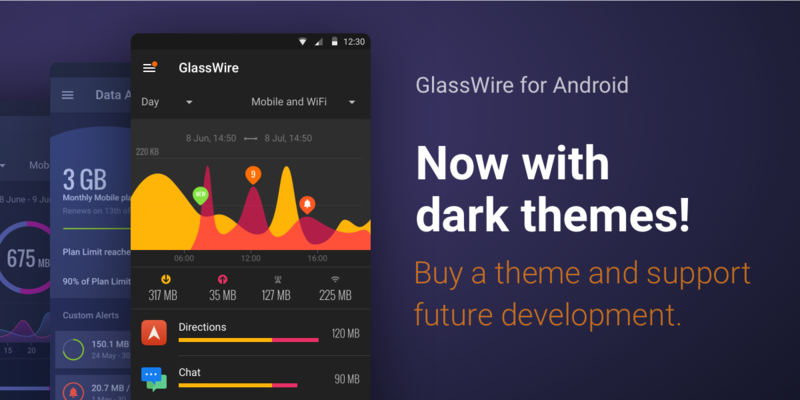 These GlassWire premium paid themes support future GlassWire development and we hope you’ll consider buying a theme or two. This update also includes a fix for Android O so GlassWire’s persistent notification is easy to read, plus some other bug fixes. Speaking of our persistent notification, a common question people ask us is why can’t it be disabled? The reason for this is because Google Play requires any apps that run in the background have a persistent notification for security reasons, so the user realizes that app is running. Our GlassWire app has to run in the background to keep track of your mobile data. To learn more about these rules check out this web page by Google itself. Also, if you’re wondering why we request the “phone” privilege, it’s because we have to request this to see the phone’s mobile data usage as explained here. Thanks for all your feedback and support and please go to the top left GlassWire menu and choose “send feedback” to send us feedback or report bugs. Get GlassWire for Android Now!